...at least for the 9 questions I studied for my 2013 paper, and for the 3 of those that Buckwaler and Stitch included in their widely-discussed paper on the subject. Plus: why has philosophy made so much less progress toward gender equality than the STEM disciplines have over the past two decades? I address these issues in my new article in Hypatia. Every great philosopher has important things to say about moral philosophy. Chomsky is no exception. Chomsky’s remarks on this topic, however, are not systematic. Instead, they consist mainly of brief and occasional asides. Although often provocative, they tend to come across as digressions from his central focus on linguistics and related disciplines, such as epistemology, philosophy of language, and philosophy of mind. Perhaps as a result, moral philosophers have paid relatively little attention to Chomsky over the past sixty years. This neglect is unfortunate. Chomsky’s insights into the nature and origin of human morality are fundamental and penetrating. They address deep philosophical problems that have shaped the aims of moral philosophy for centuries. They also reinforce many of the lessons Chomsky has taught about the nature and origins of human language. Elaborating upon these themes, this chapter begins by recounting two of Chomsky’s most extensive discussions of moral philosophy, each of which draws attention to the fact that, like linguistic knowledge, moral knowledge is an example of Plato’s problem: a complex mental competence characterized by a profound poverty of the stimulus. The chapter then places these remarks in a broader context by providing a brief discussion of mentalist, modular, and nativist theories of moral cognition from Plato to the present. Finally, the chapter responds to one prominent criticism of Chomsky’s naturalistic approach to moral philosophy, that of the late philosopher, Bernard Williams. I argue that Williams’ “Wittgensteinian” skepticism about moral rules is no more convincing than a similar skepticism about grammatical rules in the context of linguistic theory. An empirical refutation of "ought" implies "can"
In a beautifully written and insightful paper just published in Cognition, a team of researchers from Duke reports a series of studies on the “ought” implies “can” principle in ordinary moral cognition. * The main question was whether there is a conceptual entailment from what someone “ought” to do to what they “can” do, as those concepts are ordinarily understood. Adams promises to meet his friend Brown for lunch at noon today. It takes Adams thirty minutes to drive from his house to the place where they plan to eat lunch together. Adams leaves his house at eleven thirty. However, fifteen minutes after leaving, Adams car breaks down unexpectedly. Because his car is not working at that time, Adams cannot meet his friend Brown at noon, as he promised. Adams decides that he does not want to have lunch with Brown after all, so he stays at his house until eleven forty-five. Because of where he is at that time, Adams cannot meet his friend Brown at noon, as he promised. In a follow-up study, the research team collected judgments about “ought,” “can,” and “blame.” They found that “ought” and “blame” judgments correlated, that “can” and “blame” judgments correlated, but, critically, that “ought” and “can” judgments did not correlate. I encourage you to read the whole paper. At only 6 pages long, it's a great return on the investment of time! The order in which moral dilemmas are presented matters to people's judgments and can substantially influence later judgments about abstract moral principles. This is true even among professional ethicists with PhD's in philosophy. In 2012 and 2015, Fiery Cushman and I published empirical evidence supporting these claims. We invite a metaphilosophical conclusion: If even professional philosophers' expert judgments are easily swayed by order of presentation, then such judgments might not be stable enough to serve as secure grounds for philosophical theorizing. Synthese has recently published two critiques of the literature on order effects in philosophy, which address Fiery's and my work (HT Wesley Buckwalter). Both critiques make valuable points. However both also admit of some clear replies. Push: A runaway boxcar is headed toward five people it will kill if nothing is done. Jane can stop the boxcar by pushing a hiker with a heavy backpack in front of the boxcar, killing him but saving the five. Switch: A runaway boxcar is headed toward five people it will kill if nothing is done. Vicki can stop the boxcar by flipping a switch to divert it to a sidetrack where it will kill one person instead of the five. Fiery and I presented Push-type and Switch-type scenarios (fleshed with a bit more detail) to professional philosophers and two comparison groups of non-philosophers. We found that when professional philosophers saw a Push-type scenario before a Switch-type scenario, 73% rated the two scenarios equivalently on a 7-point scale. Then later in the questionnaire when asked about the Doctrine of the Double Effect -- a moral principle often interpreted implying that Push-type cases are morally worse than Switch-type cases -- only a minority, 46%, endorsed that principle. 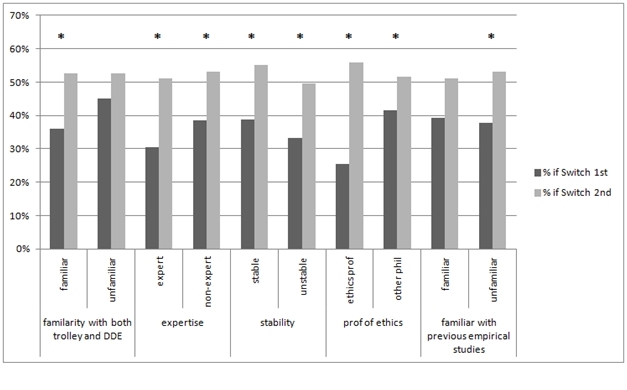 In contrast, among philosophers who saw Switch before Push only 54% rated the two scenarios equivalently, and then later a majority, 62%, endorsed the Doctrine of the Double Effect. Endorsement of the principle thus seemed to shift, post-hoc, to rationalize philosophers' order-manipulated judgments about the scenarios. We found similar effects for Action-Omission, Moral Luck, and "Asian disease" type cases (though not consistently for every measure across the board). Philosophers with PhDs and self-reported competence or specialization in ethics showed no smaller effects than other philosophers or than comparison groups of non-philosophers -- and in fact trended slightly (non-significantly) toward showing larger order effects. In general, we found pretty substantial effect sizes, suggesting substantial instability of judgment even in philosophical respondents' areas of expertise. Hence the metaphilosophical worry. Critique by Zachary Horne and Jonathan Livengood. (A.) First, they helpfully distinguish between what they call "updating effects" and "genuine ordering effects". Genuine ordering effects, in their terminology, are effects measured only after all the stimuli have been presented. "Updating effects" are measures taken along the way, and might well reflect participants' learning. There is of course nothing irrational in judging Scenario B differently as a result of seeing Scenario A because one learned something by seeing Scenario A. Most philosophical research on order effects, they note, takes the measures along the way -- and thus might be measuring learning rather than true order effects. (B.) Second, they point out that perceptual judgments also show order effects. Thus, if we are to reject any type of evidence that shows order effects, then we must reject perceptual evidence too, which would lead to radical skepticism. (C.) Third, they point out that order can sometimes reasonably make a difference to the evaluation of evidence. For example, a smile followed by a frown, on the same person's face, is a different type of evidence than a frown followed by a smile. On (A): I find the labels tendentious (since if we know there isn't learning-type updating going on, what we might want to call "genuine order effects" can plausibly be measured mid-stream), however it probably is correct that most studies do not sufficiently rule out the possibility of learning or updating in the course of the experiment, if they have novice participants and take the measurements after each scenario rather than after both scenarios. However, since our participants were experts, we think it unlikely that a significant number learned anything in the process of our brief experiment that would rationally justify shifting their judgment about the equivalency or non-equivalency of Push and Switch. And as Horne and Livengood note, our measure of endorsement of the Doctrine of the Double Effect is a measurement of a "genuine ordering effect" even by their own lights. On (B): Yes, of course it would be silly to reject all means of learning that are subject to any order effects! The epistemic sting, as they note, depends not on the mere existence of an order effect in one case, but on how large and how prevalent the order effects are. This is an open empirical question. But the limited empirical evidence that exists suggests that order effects are substantial and prevalent in moral dilemma cases. So far, we have found order effects in all of the scenario types we've tried, with about a 10-20% shift in opinion on the moral equivalency of our scenario pairs and in preference for the risky option in the "Asian disease" cases. On (C): It's interesting to consider cases in which earlier evidence rightly colors our reaction to later evidence, but trolley problems presented to disciplinary experts seems a different kind of case. Finally, Horne and Livengood suggest that exposure to a pair of dilemmas in our study is unlikely to have a long-lasting impact on professional philosophers' beliefs. I agree. They continue, "But if there is no long-lasting impact, then we think the effect is unlikely to matter to actual philosophical practice outside of the laboratory" (p. 17). I don't think this follows. Fiery's and my view is not that philosophers' opinions are permanently influenced by the order in which the scenarios are presented on any single occasion, but rather that their opinions are unstable -- possibly influenced one direction on one occasion, in another direction on another occasion. This instability is what drives the metaphilosophical worry. (1.) The respondents were not really experts. She wonders if our participants, recruited through the internet, really had the degrees they claimed to have. (2.) The respondents didn't carefully attend to our scenarios. Maybe they breezed through them so quickly that they failed to notice relevant features. (3.) The respondents might not have familiar responses to these types of scenarios. Perhaps they have so far refrained from forming judgments on such cases and principles. (4.) The respondents might not have diachronically stable familiar responses. This is the explanation Fiery and I favor. However, Rini helpfully points out that as long as philosophers are aware that their responses are not diachronically stable, the metaphilosophical threat is reduced: Presumably philosophers who are aware that their responses are not stable would be reluctant to ground their theorizing on those responses. On (1): I am not aware of a general problem in the survey literature of respondents' frequently misreporting their educational status -- though certainly a bit of misreporting is possible. One specific piece of evidence against this possibility in our own study is that we recruited philosophers mostly by asking department chairs to forward a recruitment email to faculty and graduate students in their departments. Most of our "philosopher" participants took the survey within just a few days of these emails. On (2): The median response time on the first scenario was 40 seconds, on the second scenario was 34 seconds. While these are not huge response times, if you stop to count out 34 seconds now, you'll probably notice that it's a reasonable amount of time for a thoughtful response to a brief scenario. On (3) and (4): These are potentially quite serious issues, and in fact our follow-up study in 2015 was designed specifically to address them, after we saw an early version of Rini's critique. In our 2015 study we specifically asked participants if they were previously familiar with the scenarios. We also asked whether they regarded themselves as "having had a stable opinion" about the issues before participating in the experiment, and whether they regarded themselves as experts on those very issues. We also added a "reflection" condition to help address concern (2). In the reflection condition we asked participants to reflect carefully before responding and enforced a minimum 15-second delay between when participants reported having finished reading the scenario and when their response options appeared. We did not find that self-reported familiarity or stability reduced the size of order effects in two different types of scenario pairs (trolley problems and risky-choice "Asian disease"-type problems), nor did we find reduced order effects in the reflection condition compared to a normal control condition without special instructions to reflect. Thus, I am inclined to think that Rini's fourth suggestion is the most plausible -- that participants do not have diachronically stable familiar responses, despite high levels of expertise. But since those who report having stable responses were no less subject to order effects than were those who reported not having stable responses, self-knowledge of stability appears to be largely absent. Despite Rini's interesting suggestion that instability is metaphilosophically non-threatening if people are aware of it, Fiery's and my results suggest that we should not hasten to that comfort. Both Horne and Livengood and Rini emphasize that we only have very limited evidence about order effects on professional philosophers' judgments. I agree! Fiery's and my two studies are hardly decisive. Convergent evidence from several different labs would be necessary before drawing any confident conclusions, especially if those conclusions are at variance with what one feels one knows from personal experience. Rini also makes positive suggestions for follow-up experimental work that might be done, which I am inclined to support. Both critiques raise important methodological concerns that ought to help shape and direct future work on this topic. CFA: Does Neuroscience Have Normative Implications? Elisabeth Hildt and I are organizing a symposium focusing on whether and how neuropsychology might provide insight into normative ethics. We are thrilled about our lineup of invited speakers (including the Experimental Philosophy blog's own Eddy Nahmias! ), and are excited about the submissions we hope to receive. The nuts and bolts are in this post; the full CFA is available at the link posted below. TL;DR: Submit a 200-400 word abstract, compete for a $500 travel award, indicate whether you’d like your work included in an edited volume, give a 20-30 minute presentation. Can We Have Free Will and Lack It Too? This summer I read Shaun Nichols's excellent new book, Bound: Essays on Free Will & Responsibility (2015, OUP). It includes systematic discussion of the relevant experimental philosophy, as well other empirical research, and how this relates to the problem of free will and related topics (including responsibility and punishment). I wrote a short (400-word) book note on Bound for the AJP (draft here), which prompted my further thinking and motivated a blog post. You can read a more detailed and comprehensive summary by Manuel Vargas in NDPR that raises some nice worries for Shaun. Here I'd like to summarize just one key component of Bound and raise a distinct worry for it (despite agreeing with many other claims made in the book). This key component is Nichols's discretionary view. It states roughly that, assuming our actions probably are determined by the past and laws of nature, there are contexts in which it's true that we have free will but also contexts in which it's false. Can we really have our cake and lack it too? As many readers have probably heard, Amazon's Mechanical Turk will soon (July 22, 2015) be charging substantially more for its services. Before, Mturk took 10% of what researchers ("requesters") paid workers. Now it will be effectively 40% (in the rare case that you need fewer than 10 distinct participants, then it's only 20%). Naturally, some researchers are upset, as documented at The Chronicle of Higher Education ("Researchers Complain About Changes in Amazon Tool Used for Surveys"). (1) Running even a small x-phi study on Mturk will more likely require grant money, which is scarce in the humanities. (2) An increase in operating costs will probably motivate researchers to still get the same mileage out of their funds. This makes it even less likely that workers will get paid a living wage, which is an ongoing ethical issue with use of the site. Any reactions from the x-phi community? To push or not to push? Should that be the question? (b) more people are willing to say pushing is morally permissible if other options were available to the agent. If interested, please read the post over there. And, if you wish to comment, please do so there. Here is a pair of examples we used to test people’s judgments. In each version of the story, a man makes an assertion with the intention of deceiving his audience. The two stories differed in one critical respect: the man says something false in the False version, whereas he ends up saying something true in the True version. [False/True] Jacob's friend Mary recently posted information on the internet that will alert the public to serious government corruption. Soon some federal agents visit Jacob and ask where Mary is, in order to detain her. Jacob thinks that Mary is at [the grocery store/her brother’s house], so he tells the agents, “She is at [her brother’s house/the grocery store].” In fact, Mary is at the grocery store. Interestingly, we found evidence that the response options offered to people had a dramatic effect on how they described the case. For example, if you force people to choose between saying that the man “lied” or “didn’t lie,” then they will say the man lied, even when he says something true. However, Angelo and I wondered whether this was an artifact of the mode of questioning and, thus, should not be taken at face value, in either of two ways. On the one hand, we wondered whether it was because people simply answered in accordance with how things seem to the speaker himself (perspective-taking). On the other hand, we wondered whether people thought that answering “didn’t lie" could misleadingly suggest that the man was not trying to lie, or that he did not deserve blame for his dishonest intentions (pragmatic implication). Accordingly, we conducted two follow-up experiments that gave people more flexible response options. These options disentangled the agent’s perspective and intentions, on the one hand, and the attribution of lying, on the other. If people continued to classify the man as a liar in the True condition, then it would show that the standard philosophical view nicely captures the ordinary concept of lying on this point. By contrast, if people no longer classified the man as a liar in the True condition, then it would show that the standard philosophical view and the ordinary concept differ fundamentally on this point. As it turns out, when given more flexible options, people no longer classified the man as a liar in the True condition. Instead, they judged that he tried to lie but failed to do so. Alternatively, they judged that he only thinks he lied. Here is a particularly striking figure from our final study, in which people selected between "He tried to lie and actually did lie” and "He tried to lie but only thinks he lied.” The bars represent the percent of people in the two conditions who said that the man did lie. Overall, we concluded that, on the ordinary concept, lying is not a purely psychological act. As an added bonus, in the process, Angelo might have become the youngest first-author ever on a paper published in Cognition!